As general manager, I oversee our team in handcrafting unique journeys. We believe in letting our guests experience the destination by, where possible, giving them interaction with local people. Fortunately, in Cambodia, people are very open and eager to meet tourists making interaction easier. I believe travelers should also give something back to the place they are visiting - that can include just being friendly and communicating with local people. As a travel agent, we then help on the rest in order to do things in a responsible manner by supporting as many local people and projects as possible. "Cambodia is a small country so we cover the whole country for all budgets. We specialize in personalized travel, listening to our guests and creating unique itineraries according to the interests, budget and other requirements. Where possible we try to include local interaction, be that stopping at the side of the road to try local snacks with vendors to staying at local community homestays." "After I left college I worked in Germany for a hotel that was only open from Apr-Oct. Working hard I was able to save lots of money and travel to see the world. After visiting 50+ countries I decided to get a job that allows me to help others travel. First I worked back in my home country (England) before moving to Cambodia where I set up my own travel company. The personal desire to travel is still there. However, instead of counting countries, I prefer to explore places I like in more depth and off the beaten track. " "Inevitably I should mention Cambodia. I was lucky enough to visit in 1994 and had Angkor Wat almost all to myself. It wasn't a happy time in Cambodia as the civil war was still going on and there was an air of sadness to the country. Many places were off limits and I hired a motorbike to visit the temples. It was educational more than enjoyable at that time. Fast forward to 2011 when I next visited Cambodia for a tourism trade show. I was able to see the country developing as a destination with friendly, welcoming people. The dangers were gone and the natural happiness of the Cambodian people returned. 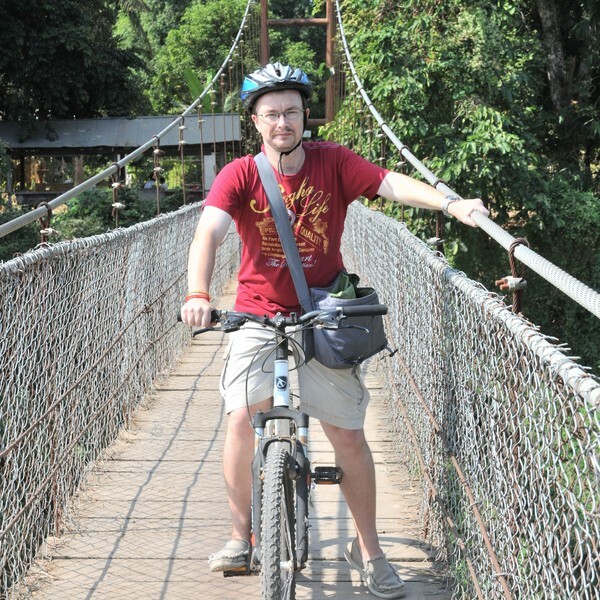 I decided to look for work in travel and moved later that year to the capital, Phnom Penh." Many thanks for taking the time to review our services. I am very pleased they met your satisfaction. I will share the comments with the guides. There was nothing too unusual about your requests. All very manageable and we pride ourselves on doing customised tours. We believe that is how travel should be...changed to meet each individuals needs. Wishing you all the best and it would be a pleasure to welcome you back to the Far East. We started the visit in Phnom Penh (to avoid the Chinese New Year tourist crush in Siem Reap) and had a great visit with Reya to the Royal Museum, National Museum, and the S21 Detention Centre and Killing Fields (pretty depressing, but obviously an important part of the country's recent history). Next was Battambang with Dy, in which we experienced the French colonial centre, saw the nearby bat caves at dusk (pretty amazing natural phenomenon), took a ride on the Bamboo train, and did a bike tour through local communities to see how they produce rice paper and other local products. Also saw the Phare circus one evening - definitely recommended. Then onwards to Siem Reap to see some of the Temples of Angkor, including Angkor Wat. Totally amazing complex and history - with some of the oldest temples in the area dating back some 1,000 years - but the truth is you'd really need months to see everything! We also spent a morning on the Tonle Sap lake, which included a visit to the village of Kompong Khleang (only possible to drive through in the dry season when the lake level is at its lowest). Here we had a really heartwarming experience - whilst checking out the local fish drying process on an extremely hot day, a fortuitous encounter with lots of kids coming out of school and an ice cream vendor lead to about 70 ice creams being handed out to all the kids in town (plus a few adults as well). The cost was nothing but the happiness generated was incredible. Aside from the sites we visited and the local cuisine, one of the highlights for us was the Cambodian people themselves - incredibly friendly, dignified, hard working. Truly amazing people. But back to the overall trip - I can't emphasize the value of Steve's local knowledge in making this trip so memorable for us. I would highly recommend - especially for first time travellers to Cambodia - booking through Steve. And as for us, we will certainly be back in Cambodia sometime soon! Thanks for your kind words. We worked hard to give you and Pamela a fabulous trip and it paid off. Of course it does help you told us about your interests and preferences. That makes the planning a lot easier. I will share your lovely comments with our guides and drivers. They are the hardest working of all. It would be a pleasure to welcome you again to Cambodia. This was an absolute pleasure from planning right through to the experience, which raged from navigating the crowded terraces of Angkor Wat to an impromptu game of "hacky-sack" Cambodian style at night on the riverbank in Phnom Penh. Our principle guide, Sarun, was a wealth of historical information and our night food Vespa Adventures tour was a highlight. The local specialists were Travel Asia a la carte and I wouldn't hesitate to recommend them to anyone who wants a tailor-made tour. Just make sure you include the Phare Circus - a highlight of our two weeks in Vietnam and Cambodia. Thanks for travelling with Travel Asia a la carte. It was a pleasure to meet you in Siem Reap and I'm glad to hear that the tour was an 'absolute pleasure'. The information received during the tour planning about your likes and dislikes was exactly what we needed to plan the perfect trip. Please share with your friends and family the wonders of Cambodia and hopefully they will visit us someday. Happy New Year for 2019 and thanks again.